The Camera Raw format, sometimes called simply Raw, was developed for photo purists who don’t want the camera to make any changes to the photo data. Camera Raw records data straight from the sensor, without applying any post-capture processes. Raw files are uncompressed, which means that they’re larger than JPEG files. 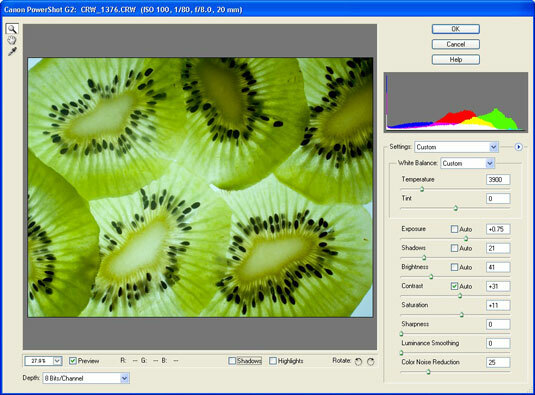 After transferring your pictures to your computer, you must use a special software tool called a Raw converter to convert your photos to TIFF or JPEG before you can do much of anything with them. Open Camera Raw files by using a special converter tool. Because of the added complication of working with Raw files, you may want to stick with JPEG or TIFF if you’re a photo-editing novice. The in-camera processing that occurs with those two formats can probably produce results that are at least as good as, if not better than, what you can do in your photo editor. Use Raw if you can’t get the results you want from TIFF or JPEG. In Camera Raw format, you can control the balance of color, exposure, and contrast.